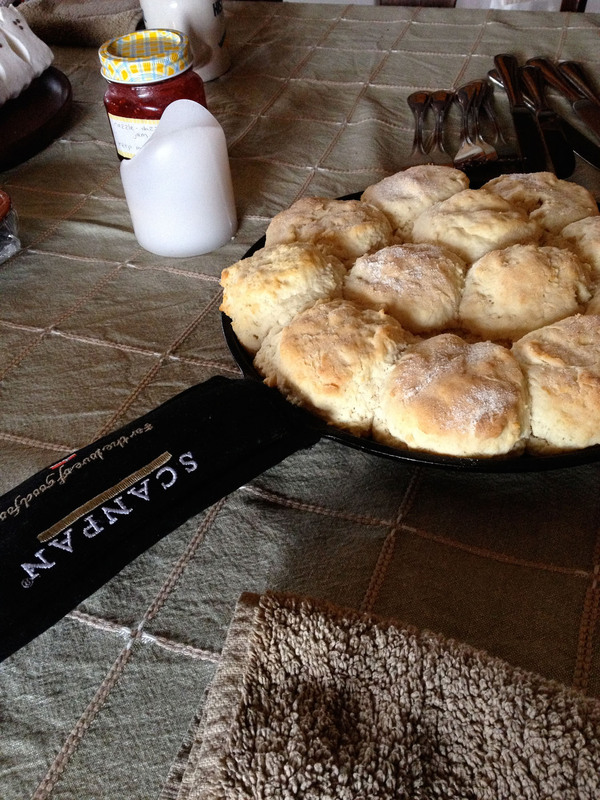 Perhaps more than any other dish I make, I get the most requests for my recipe for biscuits. I’ve posted it on this site a couple of times, but since people are still asking, I’m once again posting. I have been making them almost weekly all of my life so, although I am going to give you the recipe, I tend to make them by look and feel. Once in awhile I goof and they are a bit too light and fall apart as soon as you pick them up. And, once in awhile when I have too many kitchen kibitzers and I get to talking, I forget the baking powder which gives rock-hard lumps that get thrown to the deer. But I usually hit the mark and a batch is finished up about as soon as it hits the table. This is the basic recipe but, try to make it by feel also. If the dough is a little sticky the biscuits will tend to be lighter and stay fresh longer. Combine the flour, cornmeal, baking powder, sugar, and salt in the bowl of a food processor fitted with the metal blade. Process, using quick on and off turns, to mix. Add the shortening and again, using quick on and off turns, mix to just combine. With the motor running, add the milk and process quickly to just blend. The dough should be soft and slightly sticky. Lightly coat a clean work surface with Wondra flour. Scrape the dough from the processor bowl and lightly pat down and smooth edges with your hands. You should have an uneven circle about ¾-inch thick. Cut out circles using a 2-inch biscuit cutter or whatever else you have on hand – I often just grab a glass. Place the 1 tablespoon of butter in a large cast iron skillet over medium heat to just melt. Place the biscuits tightly in the pan. Transfer to the preheated oven and bake for about 20 minutes or until the biscuits have risen and are lightly browned. Remove from the oven and serve hot with plenty of butter and jam or pan gravy. Very tasty! I am inspired to make these this long Thanksgiving weekend and cheer ourselves up amidst all the cold weather and rain we’re having here in DC. Judie, just to prove to you that I thoroughly read all your recipes, these look just like my grandmother’s biscuits and will therefore be sumptuous but I’m wondering about the cornmeal that is listed in the text but not in the ingredients??? Sorry everyone about the omission – just add 2 tablespoons of cornmeal to the recipe. Happy Thanksgiving to all! Thank you …. Hope you had a wonderful holiday feast! And, I’m sure you did.